Cinema Sentries and Hal Leonard have teamed up to give four lucky readers the opportunity to win a book from Limelight Editions new series Music on Film. 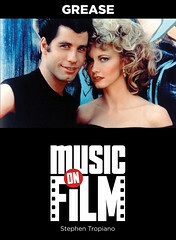 The paperbacks are 4.75" by 6.25" and "each book highlights one musical film from every angle." Grease (1978) is director Randal Kleiser's film adapation of the 1971 musical about summer lovers, greaser Danny Zuko (John Travolta) and sweet Sandy Olsson (Olivia Newton-John). When Sandy's parents decide not to return to Australia, she enrolls at Rydell High and Danny has to juggle his affections for her and his tough guy image as leader of the T-Birds. Their fellow students have other issues to deal with. Rizzo (Stockard Channing) is worried she might be having Kenickie's (Jeff Daniels) baby, and Frenchy (Didi Conn) is considering dropping out to attend beauty school. There are two copies of this book to giveaway. 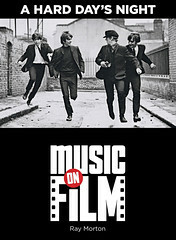 Director Richard Lester's A Hard Day's Night (1964) influenced movies the way The Beatles influenced music. Purporting to capture their lives in the midst of Beatlemania, the film follows the band as they travel from Liverpool to London for a TV show appearance. With the combination of Marx Brothers' zaniness and ingenious editing to the music, it's easy to see how the movie inspired the creation of The Monkees TV show and music videos. There are two copies of this book to giveaway. You have three chances to enter. For your first entry, simply retweet the following post on Twitter: Tweet this and include which book you want. For a second entry, leave a comment on this post noting your favorite song from the film of the book you would like. For a third entry, leave a comment on the Facebook post for this contest and note your favorite song from the film of the book you would like.